The Personal edition is fully-featured: it does not contain any restrictions, compared to the Trial or Freeware editions. You can always upgrade to the Commercial edition when you want (Personal -> Commercial): please contact us if you wish to do so. If you are not sure, you can begin with a Personal edition without any problem and upgrade in a later stage. After placing your order, you will receive instantly license details by email with instructions on how to unlock Paquet Builder Registered edition. If you already have your registering notice, connect to your account here. Above prices are named-user standard licenses where the software can be installed on up to two computers (a personal computer and a laptop computer for instance) and used only by the licensed user. A deactivation facility is provided, allowing you to transfer your license from a computer to another one at any time. You can buy floating licenses for Paquet Builder console compiler and/or GUI to be able to install on more computers than two, a networked location and allow multiple users to access it: you will need one floating license per user access to Paquet Builder at a given time. For instance, you can use a single floating license for all of your build machines, if one user manages them at a given time. If two users work with Paquet Builder simulatenously, you need two licenses, and so on. Prices are subjects to applicable local sales tax/VAT if any. Final prices are displayed when your physical location is determined. Prices in Euro are mandatory for orders from within Europe. Prices are subject to changes without notice. When you purchase a license, your activation key will always work with the version of Paquet Builder you purchase. In addition to the license key, you are given a 12-month maintenance. An active maintenance lets you receive free major and minor upgrades, access to latest versions and your license keys, priority for free basic technical support by email and support forum. In order to enjoy maintenance service 12 additional months (2 years), we recommend you to take an extension of maintenance now at a special rate. You may extend your maintenance later, but it will be at a slightly higher price. Future versions may require a new license key that will be delivered only if you have an active maintenance. If you let your maintenance expire, upgrades will cost you 60% of the new license price (25% more than one-year maintenance). If you are a registered user of Paquet Builder 2.x, please see the upgrade conditions. Previous licenses for Paquet Builder 2.x are not compatible with Paquet Builder 3. 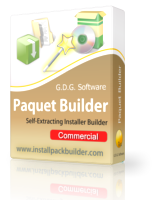 Paquet Builder also comes with a Freeware edition: it does not contain all features (you will get a warning if you use them) and it is intended for private use only. Companies are not allowed to use the Freeware edition. You can use the Freeware edition to distribute free software only. You will be asked at startup whether you want to run Paquet Builder in Free or Trial editions. Registered editions do not ask you this. The Trial edition of Paquet Builder is a full-featured release. This means that the same capabilities available in the registered software are present in this Trial edition, except that the Registered editions will never put nag messages at startup in packages. Moreover, you are not allowed to distribute packages made with the Trial edition. The goal of the Trial edition is to let you try out all the features of Paquet Builder: you can, therefore, see if it works for you. Although the Trial edition does not contain a time-out feature, we ask you to purchase a registered license after 30 days if you are interested in using Paquet Builder.